According to UN figures, there are 65 million people in the world now officially registered as refugees, living in temporary camps awaiting resettlement. 4.9 million are from Syria. Only 134,000 refugees were resettled in 2015. Millions more live in informal settlements or slums, or are in transition from one location to another. Most are isolated and jobless. Onaseye Onabolu, an MBA student at the UK’s Aston Business School, has just launched a new app which will allow the world’s refugees to develop professional networks and connect with local employers. Like a LinkedIn for displaced persons, Sona Circle lets users build professional profiles, share their skills and professional backgrounds, network with organizations, and apply for jobs. The free-to-download Apple iOS app is designed to tackle issues around labor force participation and social integration. “We want to restore the rights and dignity of five million refugees by 2022,” says Onaseye, who runs the social enterprise with his co-founder and ex-Apple software designer Archi Troko. The journey towards Sona Circle began when Onaseye and his three team-mates – Michael McKay, Dr. Raja Pappu, and Tamara Waltho – were selected out of over 50,000 candidates and 12,500 teams to compete at the annual international Hult Prize regional finals in London. The focus of the competition: to build social enterprises to combat the global refugee crisis. Through his MBA experience at Aston, Onaseye had the opportunity to present his idea at an MBA mentor dinner held at Aston Villa soccer club. His team also won the 2017 Aston Uni Hack competition and were finalists at Aston Enterprise and Santander Business Start-Up competition. When Onaseye – a serial entrepreneur and CIMA-qualified management accountant – last spoke to BusinessBecause, he was looking to develop his own Africa-focused investment consultancy, and drive impact investing in Africa. Onaseye will graduate with an MBA from Aston later this year. He’s now looking for funding for Sona Circle. With his latest social enterprise project, he hopes to start out in Europe and grow internationally over the next five years. 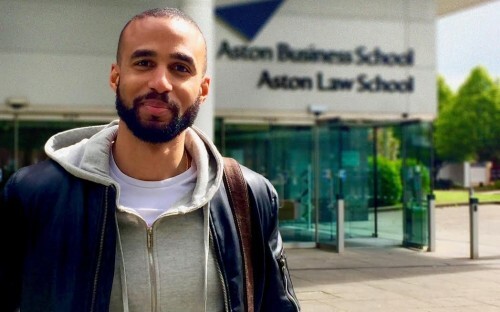 “Aston Business School has been particularly good at encouraging MBA candidates to take part in various startup competitions such as Aston Uni Hack, Aston Enterprise, and the Goldman Sachs 10,000 small business initiative,” says Onaseye. “Suffice to say, we are not short of advisors, mentors and partners. Even a couple of venture capital firms have shown a keen interest in supporting the project,” he continues.